DENVER (March 4, 2016) – Last week on Leupold’s Pigman: The Series, Brian “Pigman” Quaca was in Africa going after the elusive African bush pig. He stuck one in the daylight, something unheard of in Africa, but he has days to burn, so what else is there to do but continue hunting for warthogs and more. Tune in for Leupold’s Pigman: The Series exclusively on Sportsman Channel on Sunday, March 6 at 8:30 p.m. ET. “Photo safari is over, it is time to put some porkchops in the back of the truck,” said Quaca. Nico, Quaca’s professional hunter, helps to put the sneak on a group of warthogs in the bush, but Quaca continues to have troubles dialing in with his bow set up. And wouldn’t it just be Pigman’s luck that a severe cold front blows into Africa? “Warthogs are thin-skinned creatures full of fleas,” stated Quaca. “When it gets cold, they stay in the ground. Hunt over.” Tune in to see if Pigman can salvage this African safari. Season 7 finds Quaca back with a renewed sense of self and a new motto tattooed on his arm: Vsetko Umiera, which is Slovic for: “everything dies.” Season 6 of Leupold’s Pigman: The Series was a year of recovery and reflection for the host after a horrific highway accident in December, 2014 that left him recuperating more than hunting. About Sportsman Channel: Launched in 2003, Sportsman Channel/Sportsman HD is a television and digital media company fully devoted to honoring a lifestyle that is celebrated by millions of Americans. A division of Outdoor Sportsman Group, Sportsman Channel delivers entertaining and informative programming that showcases outdoor adventure, hunting and fishing, and illustrates it through unique and authentic storytelling. Sportsman Channel embraces the attitude of “Red, Wild & Blue America” – where the American Spirit and Great Outdoors are celebrated in equal measure. Stay connected to Sportsman Channel online at thesportsmanchannel.com, Facebook, Twitter and YouTube. DENVER (March 4, 2016) – Outdoor Channel, the syndicated cable home of the popular television series Duck Dynasty®, will launch Season 2 of the show, continuing with its format of airing back-to-back episodes on Monday nights at 7 p.m. and 7:30 p.m. ET/PT. Launching directly on the heels of the Season 1 finale, viewers can continue to enjoy another season of classic Robertson family shenanigans as they participate in peculiar day-to-day activities like lawn mower races, familial outdoor bonding, new business endeavors and more. Don’t miss the premiere of Season 2 on March 7. Duck Dynasty is the most-watched unscripted series in cable history. While the colorful Robertson family members and other cast of characters continue their antics in original episodes airing on A&E, Outdoor Channel also is finding success with the hit franchise. Boasting the tagline, “back where the beards began,” Outdoor Channel continues to support the success that the Robertson family has built since they launched their very first show on the network. In addition to appearing in Duck Dynasty, Willie Robertson, one of the show’s stars, also appears in new episodes of another Outdoor Channel favorite, Buck Commander Protected by Under Armour. “We are thrilled the Robertson family remains a hallmark brand on Outdoor Channel where they made their television debut,” added Liberatore. 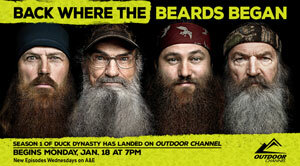 Duck Dynasty is produced for A&E Network by Gurney Productions. Executive producers for Gurney Productions are Deirdre Gurney and Scott Gurney. Executive producers for A&E are Brad Holcman and Laurie Sharpe. New episodes of the hit show air Wednesdays on A&E. Tune into Outdoor Channel for favorites like Duck Dynasty, as well as other increasingly diverse outdoor lifestyle programming. DENVER (February 26, 2016) – New episodes from two adrenaline-charged fishing television series will air this week on World Fishing Network. During the week of February 29–March 6, viewers will hop on a topnotch fishing yacht for an excursion in the Pacific Ocean, while continuing to meet the competitors from the Major League Fishing Summit Cup in exclusive interviews. Inside Sportfishing (Fridays at 9 p.m. ET): At 90-feet in length and a 25-foot beam, the Polaris Supreme, owned by captain Tommy Rothery, is one of the topline boats in the San Diego long-range fleet of world-class yachts utilized for sportfishing. Viewers will climb aboard the Polaris Supreme for an amazing journey down the Pacific side of the Baja Peninsula for some of the best yellowtail, wahoo and yellowfin tuna fishing anywhere on the planet. Major League Fishing All-Angles presented by General Tire (Saturdays at 4 p.m. ET): On the Mississippi River near La Crosse, Wisconsin viewers experience the first day of ‘sudden death’ where competitors will be eliminated. The anglers race to catch 28 pounds of fish and the first three to attain the amount will qualify for the championship round. Competitors Kevin VanDam and Ott Defoe battle over fishing in the same stretch of water while Andy Montgomery has to overcome his early mistake of being trapped in shallow water. MeatEater (Thursdays at 8 p.m. ET/PT): In the season finale, viewers will find out the conclusion to last week’s episode where series host, Steven Rinella invited his production team, Helen Cho and Brittany Brothers, to hunt whitetails in Wisconsin. Renowned farmer and outdoorsmen, Doug Duren also joins the hunting crew. Tune in to find out how the two newbies fare in the wild with two experts at their side in the final episode of this season. Launched in 2003, Sportsman Channel/Sportsman HD is a television and digital media company fully devoted to honoring a lifestyle that is celebrated by millions of Americans. A division of Outdoor Sportsman Group, Sportsman Channel delivers entertaining and informative programming that showcases outdoor adventure, hunting and fishing, and illustrates it through unique and authentic storytelling. Sportsman Channel embraces the attitude of “Red, Wild & Blue America” – where the American Spirit and Great Outdoors are celebrated in equal measure. Stay connected to Sportsman Channel online at thesportsmanchannel.com, Facebook, Twitter and YouTube. DENVER (February 23, 2016)– Turkey talk is just a gobble and cluck away with Sportsman Channel’s Talkin’ Turkey presented by Avian-X returning for the fifth year with 12 hours of all-turkey hunting action featuring new episodes of Avian-X TV with Matt Morrett and viewer favorite shows from Turkey Man with Eddie Salter. Tune in for three hours every Saturday beginning at 5 p.m. ET on February 27, March 5, 12 and 19 exclusively on Sportsman Channel. Kicking off the turkey “talkfest” is a special episode on February 27 at 5 p.m. ET featuring country music star Blake Shelton hunting turkey with the Avian-X crew at Shelton’s home in Oklahoma. For full schedule and videos visit: http://www.thesportsmanchannel.com/. 5 p.m. – Avian-X Red Dirt Strutters (NEW) – Host Matt Morrett travels to his buddy Blake Shelton’s home in Oklahoma for up-close turkey hunting action. Matt meets his match with a tough, crooked tailed longbeard. 6 p.m. – Avian- X Rut N Strut Longbeards (NEW) – World Champion Turkey Caller Josh Grossenbacher meets up with Todd Rogers, owner of Rut N Strut Guide Service, for an unbelievable day of turkey hunting. 7 p.m. – Turkey Man Friends and Family – Eddie has a couple of people in the hot seat this week from good friend, Matt Busbice, to most of his family and they are all talking about the same thing: hunting longbeards. 7:30 p.m. – Turkey Man Buckets & Beards – This week Eddie has Matt Busbice in the chair to talk about an infamous hunting incident in Hawaii. And Eddie learns that Hawaii has turkeys galore. 5 p.m. – Avian-X Rolltide Longbeards (NEW) – Josh Grossenbacher and Pro Staffer Terrance Williamson team up on tough Alabama longbeards. Then Matt Morrett joins long-time friend Rigby McMillan down in Lower Alabama for a variety of southern turkey hunts that will have viewers dreaming of spring. 5 p.m. – Avian-X Last Stand Longbeards (NEW) – Champion callers Hunter Wallis and Josh Grossenbacher team up in New York and Pennsylvania. And in usual fashion, they bring it down to the wire to get it done. 6 p.m. – Turkey Man Assassins and Barbers – Eddie drops in on the Trained Assassins this week and trades a hair cut for turkey stories. 6:30 p.m. – Turkey Man Assassins and Barbers, Part 2 – Uncle Rusty is in the chair as Eddie continues his talk with the Trained Assassins. 5 p.m. – Avian-X Family Traditions (NEW) – Cold temperatures and flocked up turkeys create a challenging hunt as Matt Morrett takes his daughter Madison to upstate New York for a shot at her very first longbeard. 6 p.m. – Avian-X Kansas World Hunting Championship (NEW) – Matt Morrett and Pete Angle team up at the World Turkey Hunting Championship in Kansas. Do they have what it takes to come out on top? 7 p.m. – Avian-X Southern Comfort Longbeards – Southern Comfort Longbeards join Matt Morrett as he travels to Florida and Alabama to start off the season. 5 p.m. – Avian-X Snowy Strutters – Matt Morrett finds himself chasing longbeards in the middle of a Kansas snow storm. 6 p.m. – Avian-X Longhorn Longbeards – The Avian-X crew joins Fred Zink in the Longhorn State as they spend some incredible days in the turkey woods of the Mossy Oak Rio Round Up. 7 p.m. – Avian-X Neon Light Longbeards – Welcome back to Blake Shelton’s Oklahoma Turkey Camp, where there is 100% chance of good times, lots of laughs and guaranteed #FLOPPAGE. DENVER (February 17, 2016) – Jana Waller, host of Sportsman Channel’s “Skull Bound TV,” received the National Wild Turkey Federation’s Communicator of the Year Award at the 40th Annual NWTF Convention in Nashville, Tenn. during recent ceremonies. “Skull Bound TV,” part of Outdoor Sportsman Group Networks’ Sportsman Channel, has aired on the outdoor lifestyle channel for five seasons and Waller has continually shared hunting and conservation issues with her audience. Waller is known for regularly inviting wounded veterans from Wishes for Warriors and other organizations to join her on filmed hunts. She also pens articles for Turkey Country magazine and is an NWTF spokesperson. The NWTF selected this year’s award winners based on how their work strengthens the ‘Save the Habitat. Save the Hunt.’ initiative. Waller takes time during each episode of “Skull Bound TV” to discuss the important role that hunters play in preserving our hunting heritage and conserving wildlife and habitat. She also encourages her viewers to join the NWTF and other conservation organizations. MeatEater (Thursdays at 8 p.m. ET/PT): In this week’s seasonal Cooking Special episode, Steven Rinella gives the “how to” on breaking down an entire whitetail deer. After gutting the deer, Rinella describes how to transform the meat into steaks, roasts, shanks and then enlightens the audience on how to turn the oddities that are often discarded into something edible.